The number of people travelling by bus has reached an 11-year high of 4.72bn journeys, according to a public transport association report. The Confederation of Passenger Transport (CPT) said the figures for 2006 - the most recent available - showed a 3% rise on the previous year. About 1bn of the bus journeys made in 2006 were for shopping - outstripping those made to work and to school. 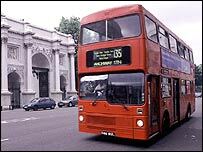 Transport Minister Rosie Winterton said the report showed how vital buses are. The findings were released as part of the CPT's new publication On The Move. Speaking at the launch of the publication in Leeds, Ms Winterton said: "Buses are a vital part of our local transport system. "Two-thirds of public transport journeys are made by bus, connecting people to essential services, to jobs, to leisure, to friends and family."